A simple semicolon definitely works. It’s small but has a very powerful meaning so you can put it in your wrist. You can also place it there so you can remind yourself not to self-harm or to do the deed. An “and” (&) symbol could also be a great partner reminding you that you can add more to the sentence. 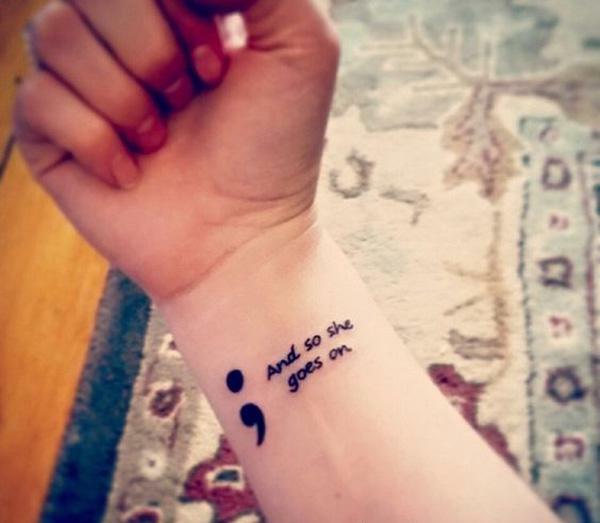 You might have noticed this tattoo trend over the recent years, it’s the semicolon tattoo. Yes, the semicolon as in the punctuation mark (;). It has gained some popularity these past years and it has every reason to. It’s simple and it can be incorporated in a lot of different designs. But the best of all is the message and the cause that is behind this tattoo. For everyone who had it and are having it, this means a whole lot for them. 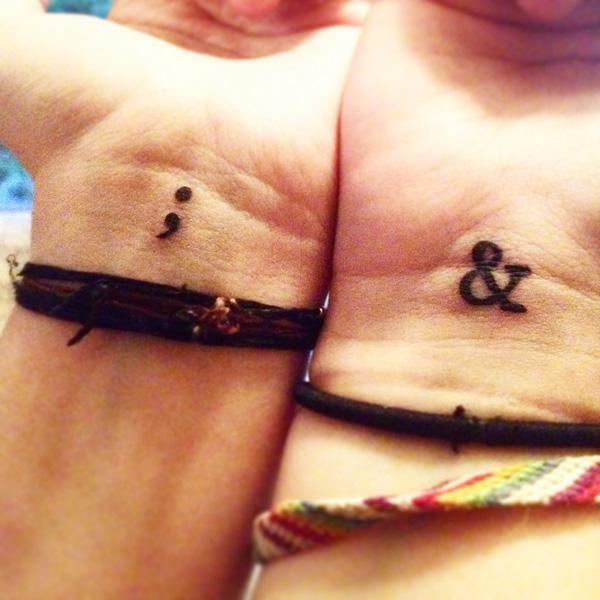 Project Semicolon was first started by Amy Bluel. 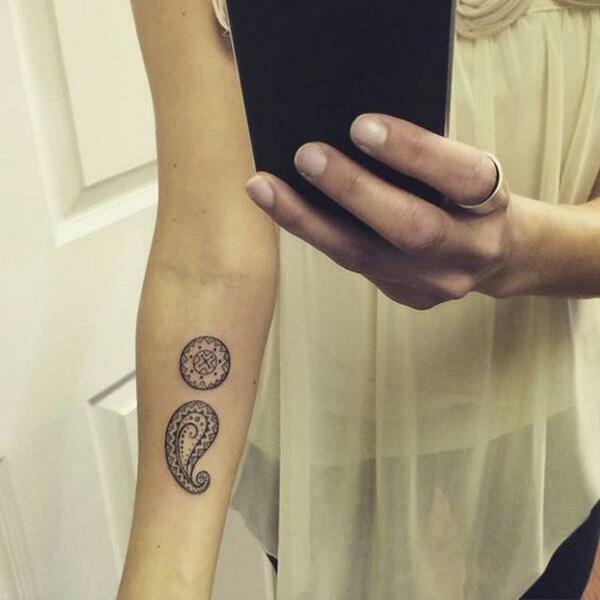 She got the tattoo in honor of his father whom she lost to suicide. Project Semicolon, or when you get a semicolon tattoo, you are raising awareness for mental health issues. 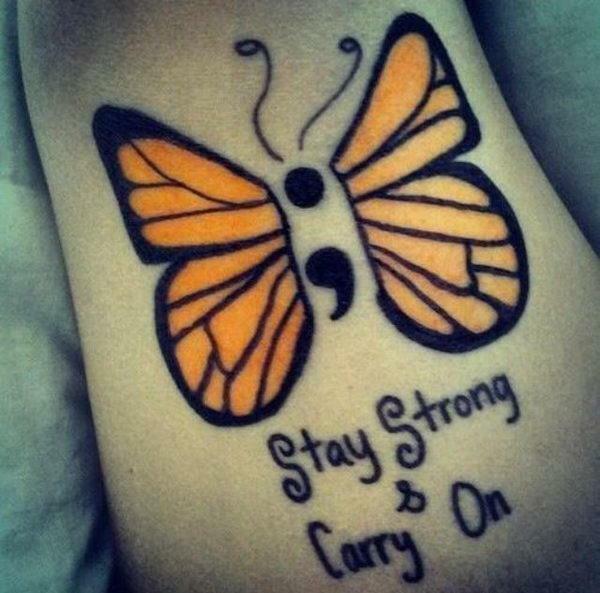 This is also a way to help prevent suicide. 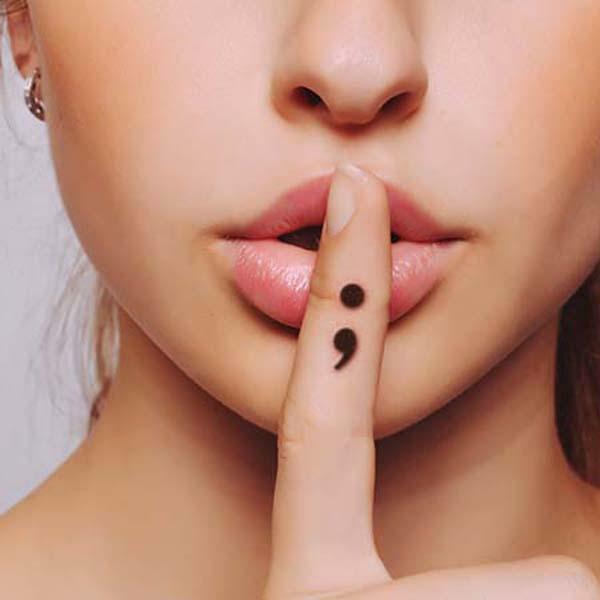 One of the main goals or Project Semicolon is to raise awareness for mental health issues such as depression, anxiety, self-injury, suicide and addiction. 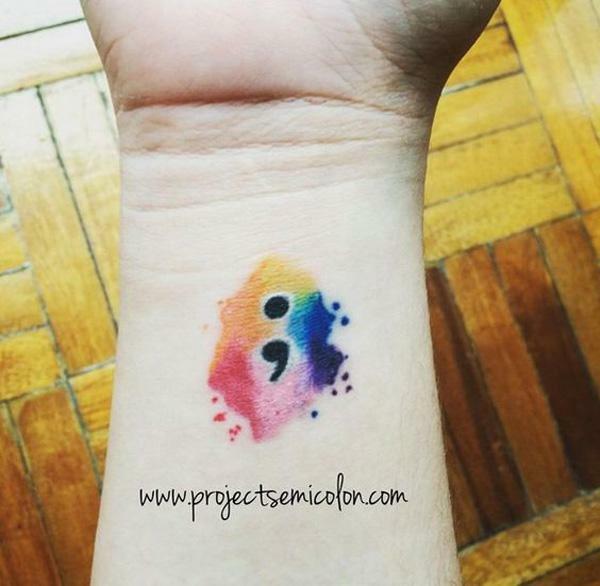 Project Semicolon was launched to give hope and love for everyone suffering these medical conditions. Depression is one of the biggest mental health issue that has ever been around. It strikes millions of people. Some of them doesn’t even realize what they have until it has gone down to the point of giving up. There are also a lot of misconception about depression. A lot of people think that it’s a common thing; that all people get depressed. It is definitely not normal. It’s a recurring thing and it doesn’t completely go away. The emotion they were all talking about where just moments of downs, usually with triggers such as a bad moment. But, depression can strike anytime. It can attack you even in the middle of the street or talking to someone. It doesn’t need a trigger to pull you down. Depression is a medical condition that not all people have. It’s far different from feeling down and incredibly sad. Most of what depressed people feel is emptiness; it’s like you’re a completely hollow person. You feel nothing. Along with it is a sense of guilt and hopelessness. Anxiety is usually paired with depression but it can also be on its own. It’s also a mental health issue that is ten time worse than the normal feeling of anxiety we have. It can completely hinder someone’s personal life from flourishing. It can banish people that you love. Suicide, a taboo for most people. It’s almost something that people are disgusted with because taking your own life really is bad. However, for people with mental issues, it’s the last resort. Just like what death is to cancer, suicide is to depression. If you want to join the Project Semicolon to remind you that you are loved and that you have to keep living; or in honor of people you have lost, here are some inspirations. Semicolon is for continuing when you wanted to end. Butterflies are for new beginning. Everyone always deserves a second chance in life and for life. I think this tattoo actually says it all. 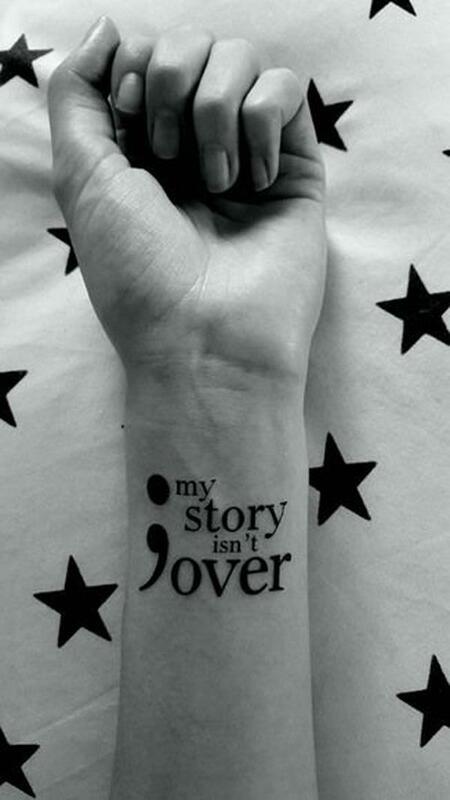 Besides a big semicolon tattoo is a message that says “my story isn’t over”. It’s going to be a reminder for you to stay strong when it feels like you’re giving up in life. 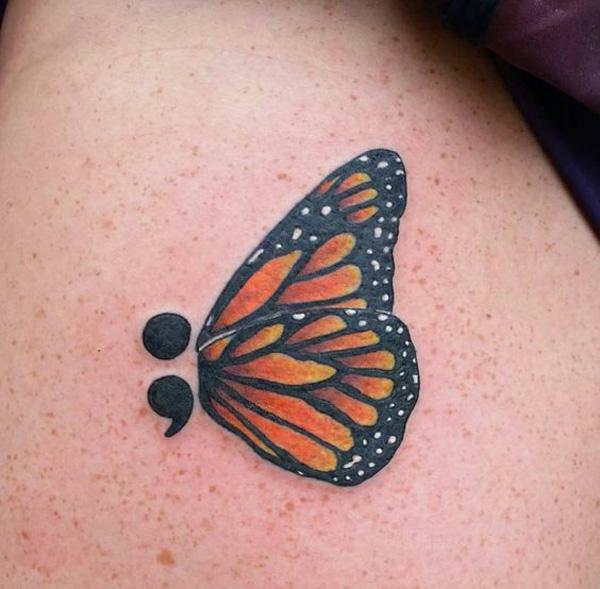 If you want a bit more of a color to your semicolon tattoo, this beautiful and perfect splash of color could be a great addition to the design. It could simply mean you’re having a colorful life ahead so don’t give up now. 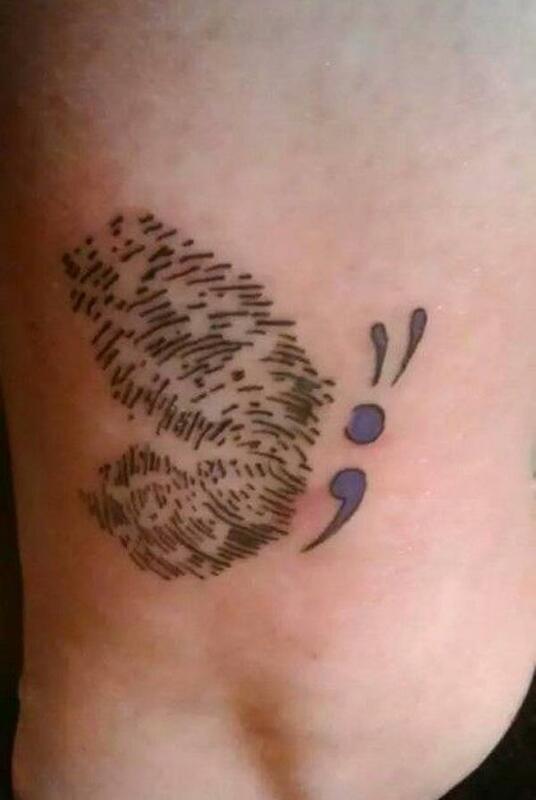 Just a little bit of fun to your semicolon tattoo. You can make it look like a cat. Because it actually looks like one if you really look at it. Placing a semicolon near your heart in a heart-shaped polka dot tattoo. Love your life. Or share love to someone you know is going through an unspoken battle. 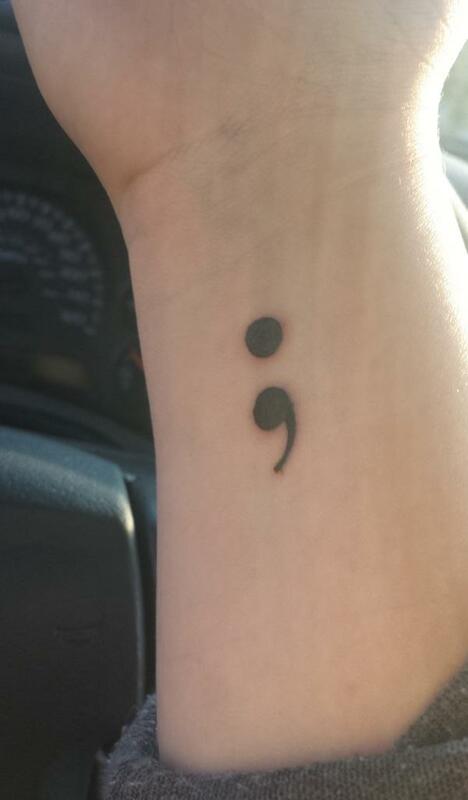 One of the most common places you can place a semicolon tattoo besides your wrist is on the side of the finger. It’s intimate since it’s not really someplace that can be easily seen. 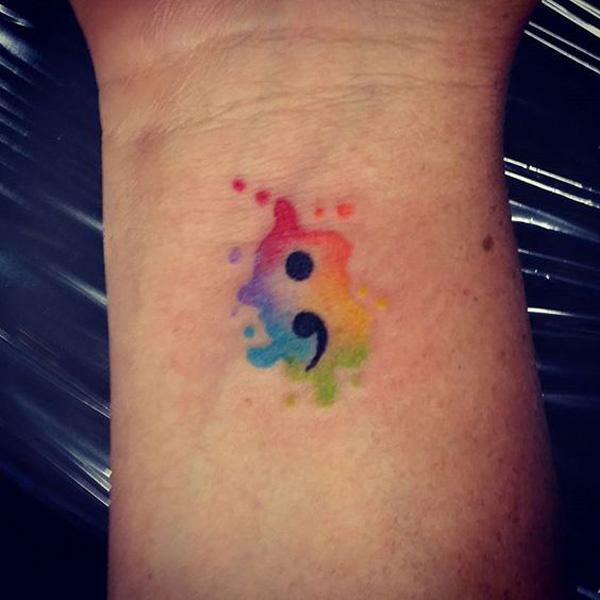 Another alternative to the rainbow splashed semicolon tat. This one is more vivid. 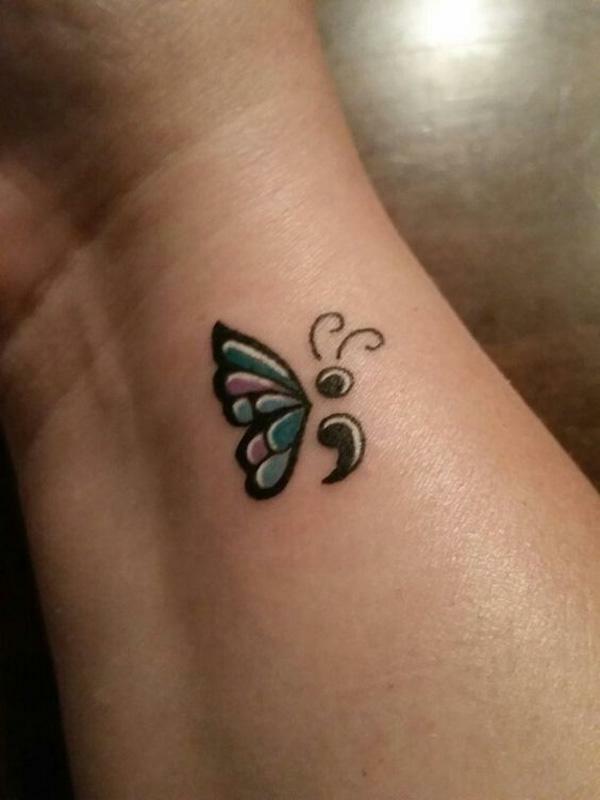 A beautiful butterfly semicolon tat. 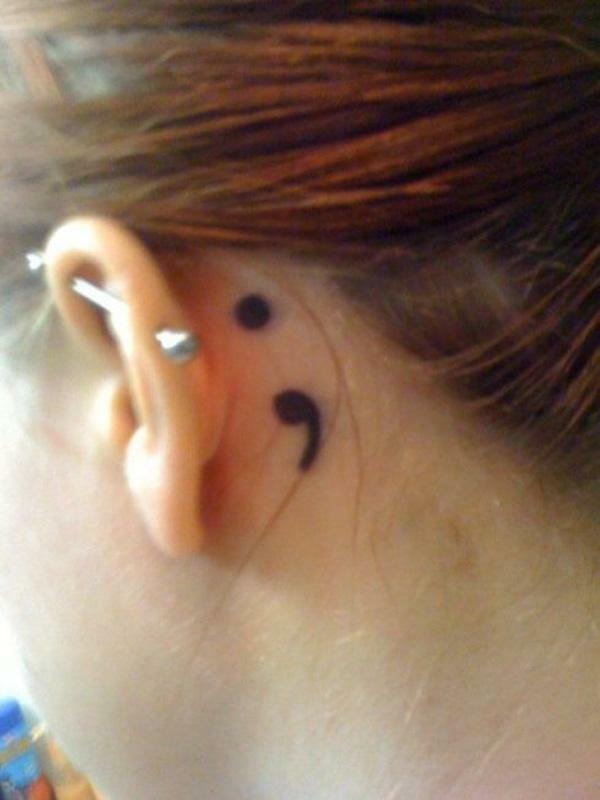 The semicolon serves as the body of the tattoo. Which could mean that before you can have a real new beginning, you have to live your life. 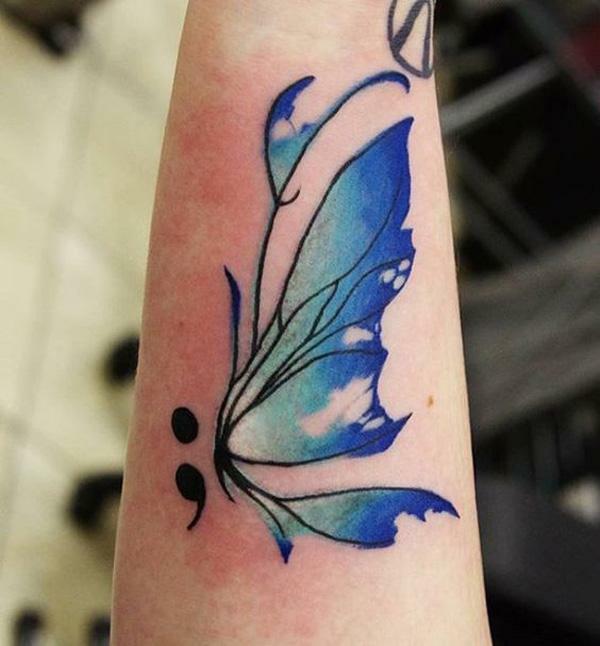 Another unique semicolon tattoo and butterfly design in one. Of course, the symbolic semicolon is there. But instead of normal wings, the butterfly has more likely fingerprints as wings. It’s definitely great since you could express your own identity. 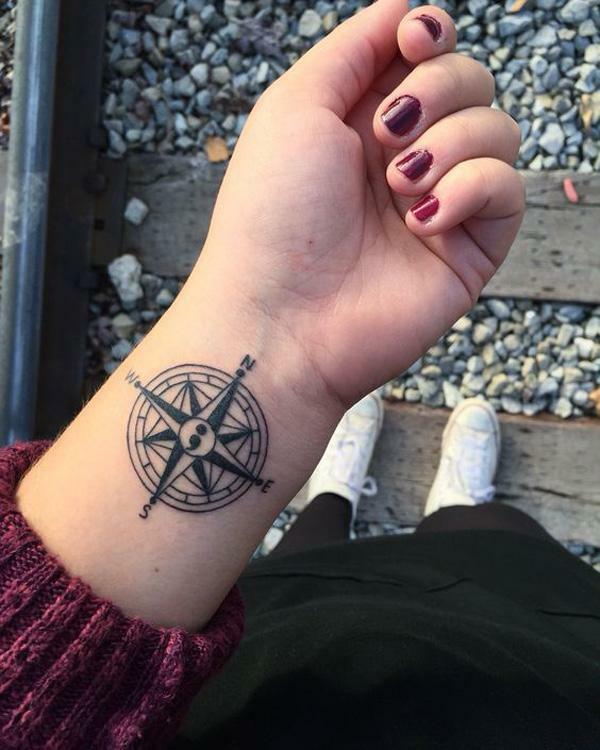 A compass is a symbol of staying in course in life. But it is also a beacon of hope for sailors in an unforgiving sea. In the center of the compass is the semicolon tattoo. 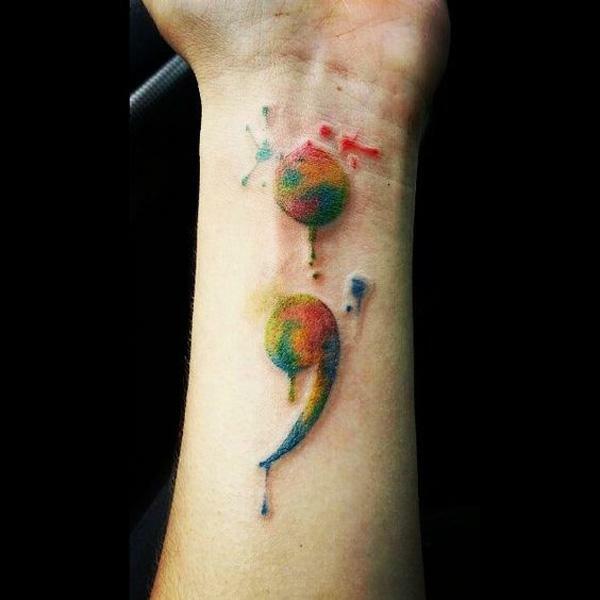 You can add a message to your semicolon tattoo; something that will remind you to be strong in life. 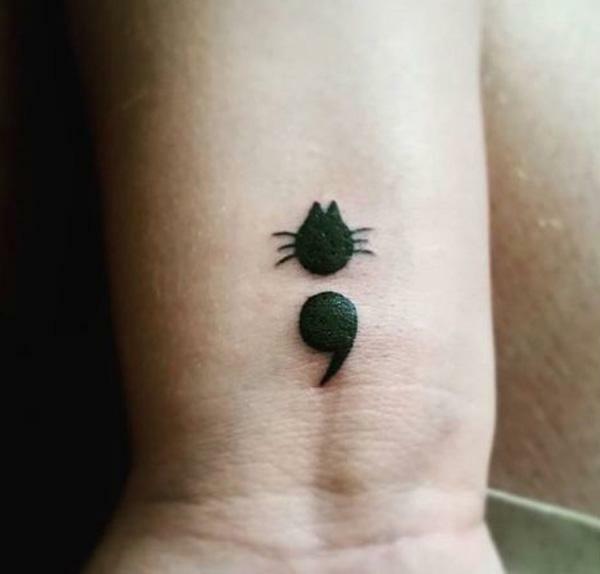 A simple semicolon tattoo will really do. It doesn’t need to have much design to look beautiful because it’s message already is. 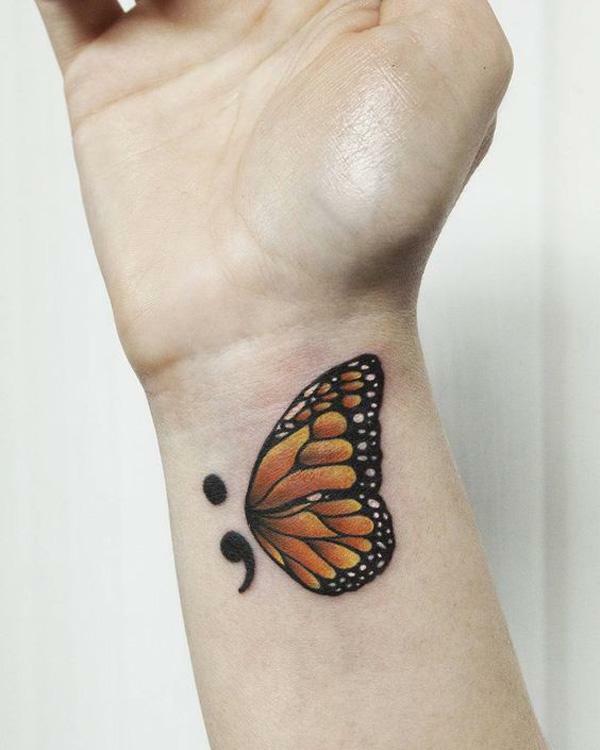 The combination of semicolon and butterflies are very popular because of the message these two symbols convey. Put together, you have your own life savior. This one is like the other splash of rainbow colors, but this one is different since the colors are outlining the semicolon rather than having a black symbol and colors around it. If you want a more discreet place to put your tattoo, you can have it behind your ears. You can also place one near the heel of your foot. 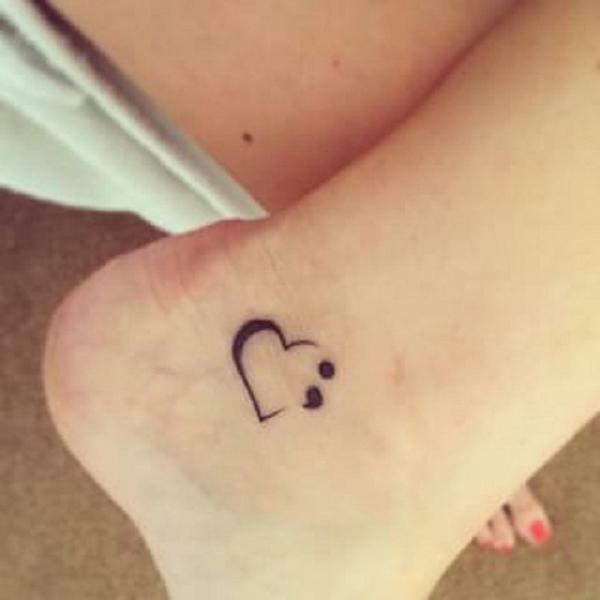 This one is a semicolon and a simple heart tattoo. Just says love your life because there are people who love you. 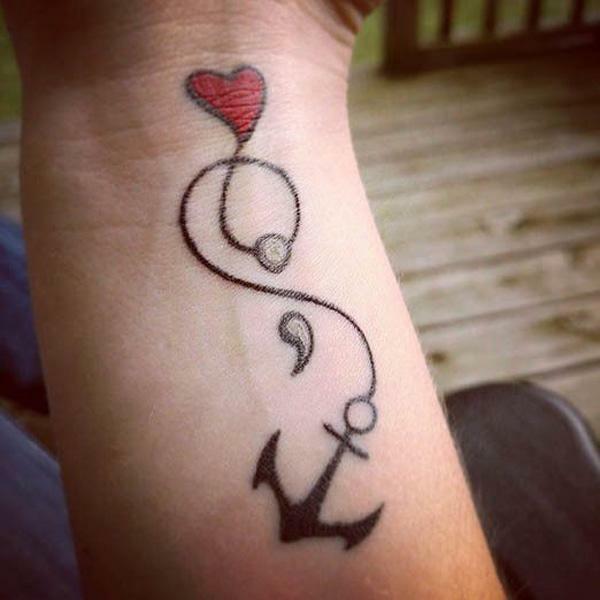 An anchor could mean steadiness or loyalty. It could also be a great combination for a semicolon tattoo. It could show your loyalty to life or to someone you have lost. “And so she goes on” means that even when she really wanted to, she decided not to and went on with her life. 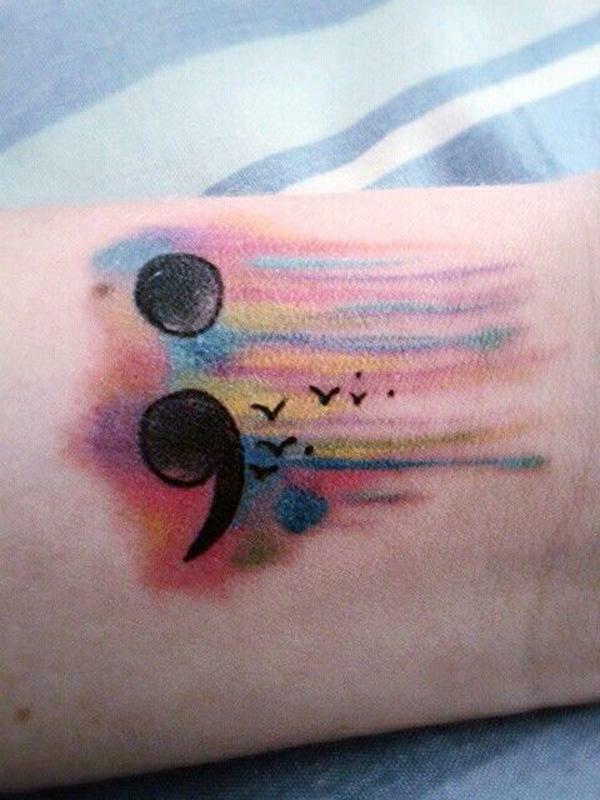 Semicolon tattoo with rainbows and birds. Birds is a symbol of freedom. It could mean that once you have decided to live, you are free to do what you want to do with your life. You’ve only got one chance and it’s best that you do the most of it. 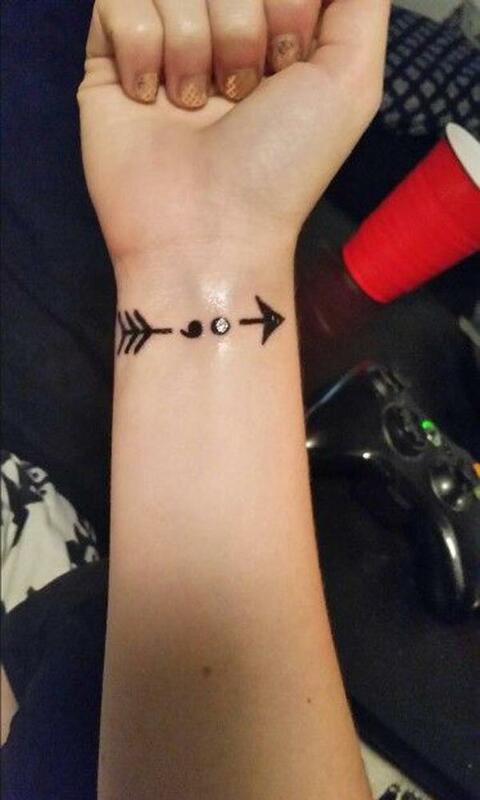 Arrow, another great companion for a semicolon tattoo. It means great courage to move forward with your life. It also takes great courage to fight depression, suicide and self-harm. You can also place the tattoo on your ankles. 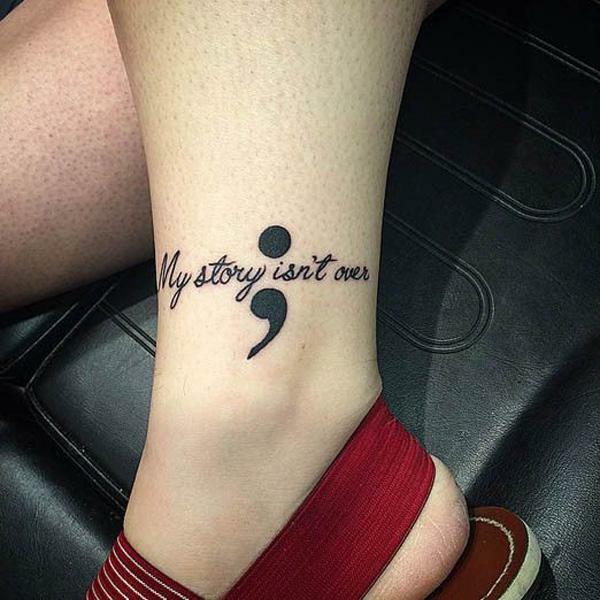 This one has got a really strong but simple message; exactly what Project Semicolon is all about. This beautiful blue butterfly with leafy wings can definitely be a perfect tattoo if you want to convey a message while having a great tattoo. 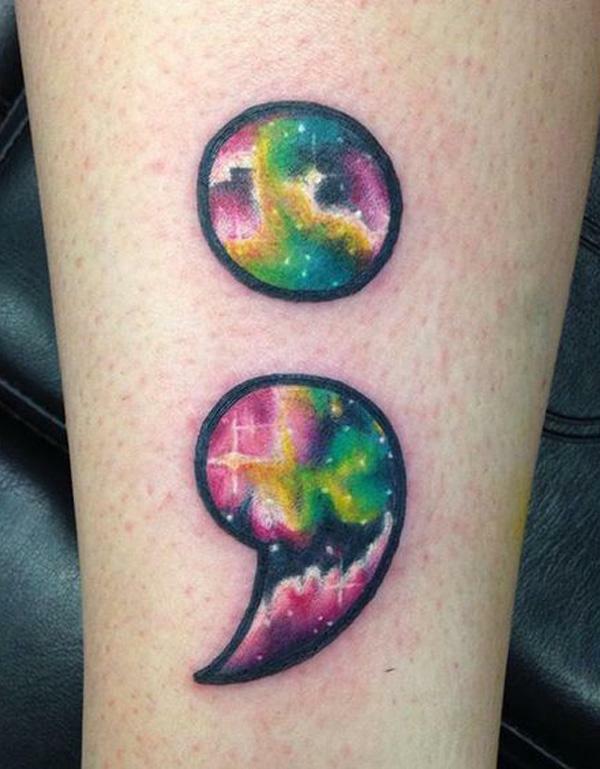 A great semicolon tattoo with the universe within it. Totally alluring. But behind the design is a great meaning. 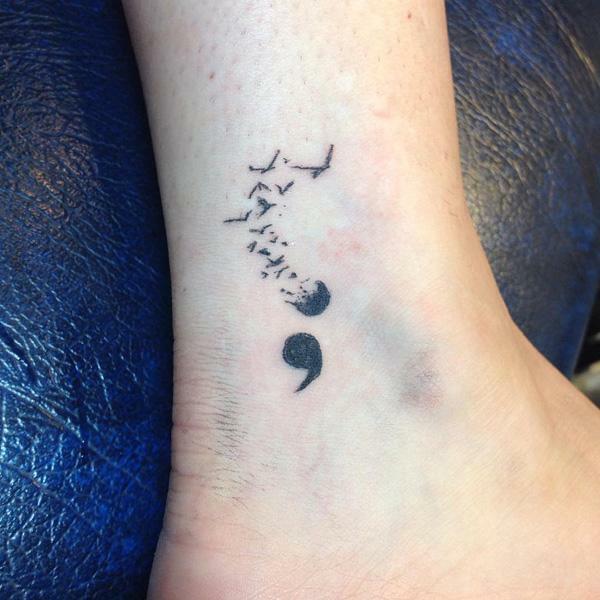 A semicolon tattoo with the upper dot fading into birds. This is definitely a great design for simplicity but for the best story. 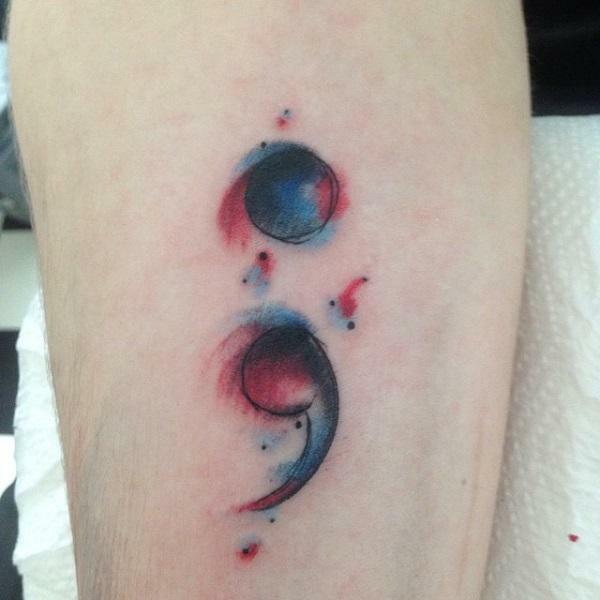 This one is a semicolon tattoo with shades of red and blue for a little more life to it. This one has a lighter and more feminine touch to it than other styles. Probably because of the accompanying flower. 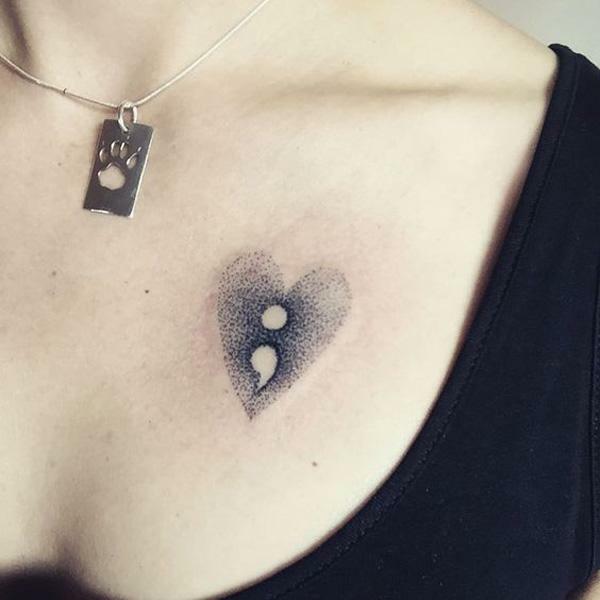 Almost like a lifeline, this heart and semicolon tattoo is one of the most common designs. 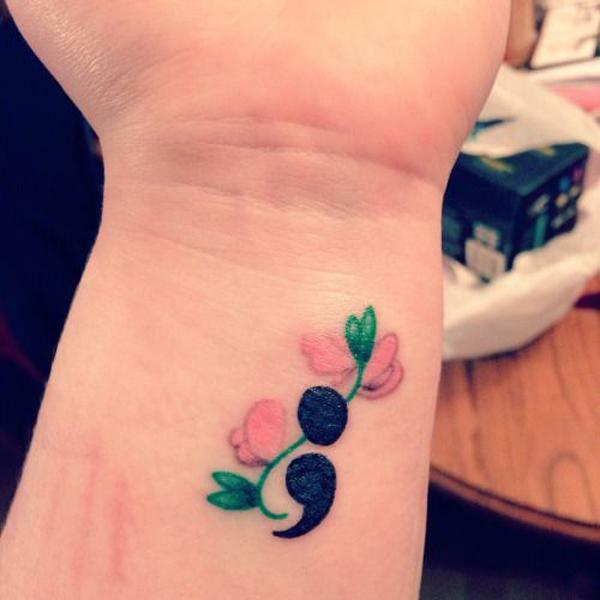 This semicolon tattoo design has a mandala design within it. Mandala usually represent continuty and eternity. 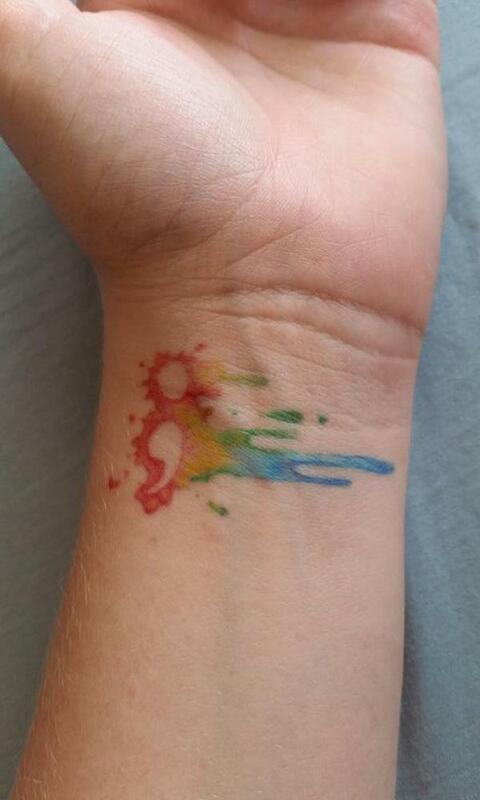 Get this colorful semicolon tattoo and have a colorful life. 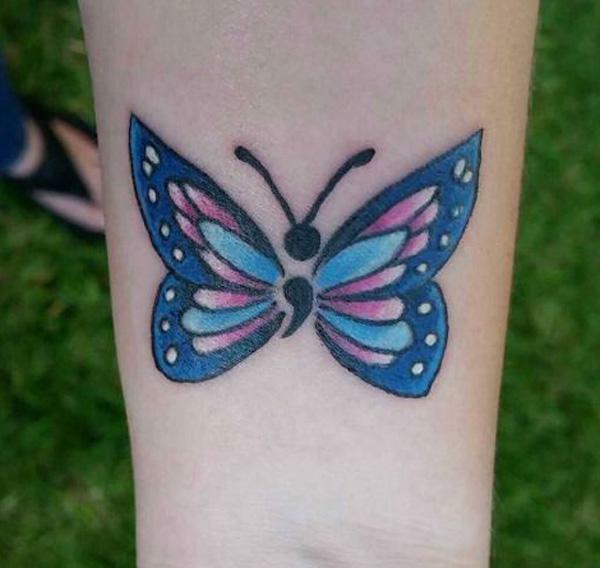 Another beautiful buttery and semicolon tattoo to have. You can choose the color and size of the design. I absolutely love the semi-colon with the birds. Can you explain the birds? Thank you so much. I want this tattoo, just need complete understanding. 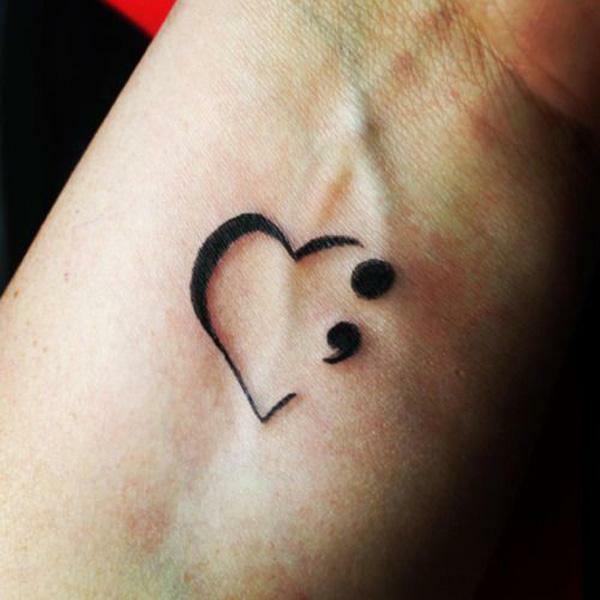 Am going to get a tattoo of a semicolon because I need to know that life’s worth living.i have major depression and PTSD and anxiety.people just don’t understand me.